Price is per 16-inch strand of these beautiful beads - each measures 8mm x 5mm, about 80 to the strand. Amber has been called “petrified sunlight” or “frozen gold”. Its bright yellow conceals the mystery of the gem, producing jewelry that makes the wearer both look good and feel good. No wonder it is so fashionable in the 21st century. Amber jewelry can create an effect that no diamond can ever do. Our amber, like most today, is ambroid amber - an affordable, immature variety of copal amber mixed with synthetic resin. Mysterious amber was at one time believed to be of divine origin because no one knew were it came from. Alchemists thought amber was formed from the rays of the setting sun, concealed in the evening sea and cast upon the shore in the form of the stone. Years ago it was found that if you rubbed amber against a wool cloth, it became electrically charged, attracting small objects. This is where the word electricity originated: “elektron”, the ancient name for amber. It was thought the stone could magically draw power and energy into its bearer, so people started making amulets from it. Amber was also believed to aid the intellect, prescribed for memory loss and anxiety. And the ancient Romans thought powdered amber taken in a cup of wine could cure fever or asthma. True amber was formed up to 60-million years ago where seas were then forest. Resin from these trees dripped down to accumulate in puddles. Over millions of years the land was replaced by sea and the weight formed this resin into amber which eventually floated to the surface. Although usually yellow, brown, orange, or green, amber ranges from nearly white to almost black - darkening to a rich red-brown with age. Amber has been imitated for hundreds of years. Some amber beads found in Egyptian tombs were made from copal – which is also fossilized tree resin, but only thousands of years old. Ambroid, although known as pressed or reconstituted amber, is made from real amber scraps and shavings generated by amber carvers. These tiny pieces are collected and heated, then pressed into large blocks. Keep your amber away from hot water or hot surfaces. 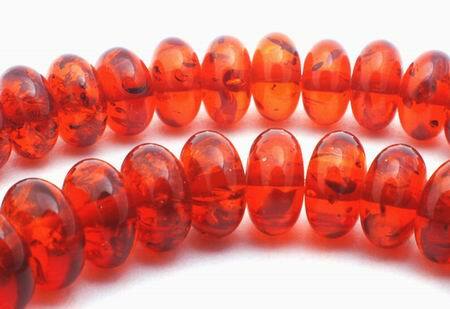 Because amber is soft and wears easily, protect it from rubbing by wrapping it in a soft cloth when not wearing it. Remove light soil with a soft cloth dipped in lukewarm water. You can put the shine back into today’s amber by spaying with wood polish like Pledge.